Many people who are fortunate to live in areas with corncrakes have never seen one. This secretive bird is best recognised by its rasping call and slight twitching of leaves as it moves effortlessly through tall grass and herbage to stay concealed in cover. The surprisingly loud and instantly recognisable crex crex call of a male corncrake evokes summer nights in the Outer Hebrides walking along paths surrounded by the lush and colourful machair. It’s difficult to imagine that these elusive birds migrate an incredible distance each year, first crossing the Sahara to West Africa in October and then moving on in another long flight to the Congo Basin just before Christmas. Then the birds retrace this route in March, arriving back in Scotland at the start of the breeding season in late April and early May. At the end of the 19th century, corncrakes bred in every region of the UK, with accounts indicating that corncrakes were even present in the central hustle and bustle of Edinburgh city centre. However, in the early part of the 20th century, the species suffered severe declines. By the 1990s they were restricted to the far north and western fringe of Scotland, with a population numbering less than 500 calling males. The primary driver of this massive decline and range reduction was the mechanisation of hay mowing which destroyed nests and young. When hay was cut by hand, many meadows in which corncrakes were nesting and rearing chicks were left undisturbed until after the young had fledged. Even if mowing occurred while there were still flightless chicks, they could often escape. With mechanisation mowing could be done more quickly and completed earlier and mowing from the outside of the field inwards resulted in young birds being herded into the centre of the meadow and killed when the last few swaths of hay were cut. Later on the loss of habitats such as late-mowed hay meadows and patches of flag iris and cow parsley used by the birds as cover in spring also contributed to the declines. Increasingly early hay and silage harvest dates, further reduced the birds’ breeding success. Male corncrakes build saucer-sized nests on the ground for their mates and the females then rear their chicks in the tall grass, feeding them on beetles, snails, worms and other small animals. Most females rear two broods in the summer, one after the other. The vegetation they use must be tall enough to hide them, so they avoid heavily grazed fields. In spring, they rely on ungrazed patches of tall vegetation at the edges of fields and next to wetlands, but in early summer they move into hay and silage fields as the grass grows tall enough. This makes them particularly vulnerable to mowing. 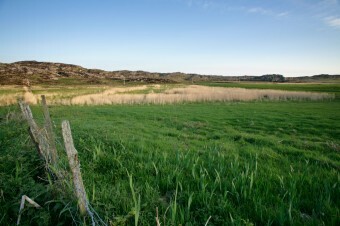 To combat this problem, alternative, corncrake-friendly yet agriculturally viable management and harvesting techniques were developed, refined and demonstrated on RSPB nature reserves and in voluntary schemes with crofters and farmers on Scottish islands. 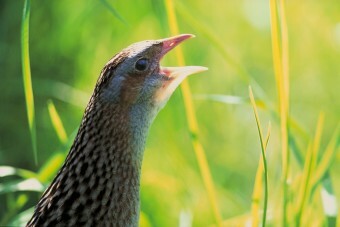 As a result the pioneering Scottish Corncrake Conservation Programme was launched in 1991. Initially, this involved the RSPB approaching farmers with corncrakes on their land and offering conservation payments for delaying harvesting and changing mowing practices to allow time for eggs to hatch and chicks to leave the nest. Special mowing methods also allowed chicks present in the grass at mowing to escape to safe refuges nearby. 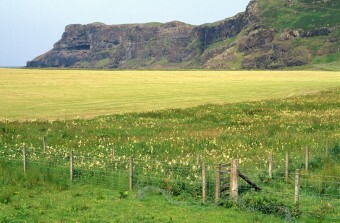 Farmers were encouraged to establish ungrazed refuge areas that corncrakes could use in spring and also in late summer after the grass is mowed. The programme worked to build partnerships between agricultural communities, conservationists, government and agencies to devise simple corncrake management prescriptions to halt the decline and incorporated them into standard agri-environment schemes, implemented later by government agencies. A dedicated advisory support and outreach service was developed to assist farmers in accessing the payments. 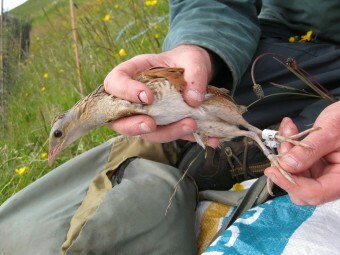 By 1998, the majority of grassland managed for corncrakes in Scotland was being funded by EU-sourced agri-environment schemes, rising under successive schemes. The result has been a spectacular reversal in the UK corncrake population. Numbers have more than doubled since the early 1990s with corncrake payments forming a significant part of agricultural incomes in the High Nature Value extensive cattle areas of the Scottish Highlands and Islands. 1,289 calling males were recorded in Scotland between May and July 2014 as part of an annual RSPB Scotland survey, the most successful season in at least 45 years. The new figures are a welcome surprise to experts after the species suffered an alarming decline of 23% in 2013.